Over the years, Big Finish has only ever had a couple of incarnations of the Master. Geoffrey Beaver's, Keeper of Traken version appeared in 2001's, Dust Breeding while a new post-Anthony Ainley version appeared in both Master and Mastermind. He has now gone of feature in a number of Fourth Doctor Adventures with The Light At The End and Jago and Litefoot. Beavers' incarnation has proved popular because of his cadaver appearance and his silky, seductive voice. 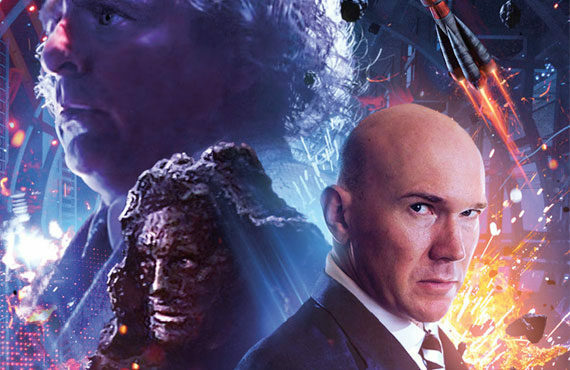 Alex Macqueen's incarnation, a post Eric Roberts one, appeared in UNIT: Dominion and then Dark Eyes 2, 3 and 4. Macqueen's Master is playful, delighting in his multitude of deceptions as well as laughing at his own jokes. But he is also completely capable of turning on a dime and becoming self-serving and deadly. Author, John Dorney brings these two incarnations together here in The Two Masters. But whatever expectations you have about this story being one like the multi-Doctor stories, then throw them away. This is a story which is nothing like those. First of all, this is a difficult story to discuss, as what is going on is shrouded in mystery from the get-go and only gradually becomes apparent. The Seventh Doctor is travelling alone and soon discovers that holes have begun to appear in the universe. It is all something to do with the Beavers Master but the Beavers Master isn't exactly himself these days. The reason behind this is very fun and allows Beavers to play his Master in a way he hasn't done before. I always seem to delight in the Master's trouble at Big Finish but I really enjoyed things here. When the two Masters finally meet, it is delightful. We've had our fill of multi-Doctor bickering and multi-Master bickering turns out to be so much more fun. Just listen to Macqueen and Beavers argue over the deployment of puns while murdering everyone if you don't believe me! I would have never guessed that this was a story I had wanted but I found every moment with the pair delightful. But at the same time, The Two Masters is complicated and ultimately completely irrelevant. There are some HUGE flashback sequences which require the listener to make sense of everything as well as a bit of chronological discussion on the placement of this tale in conjunction with the other two in the trilogy.